What is that strange green mark on Tom’s leg? Why is he beginning to feel different and why are his legs starting to tingle? Could it really be that Tom is a robot? Facing challenges is a natural part of growing up and going to school. Just like all children, Tom in this story must learn to be brave and strong. After returning from Robot Island, the green mark on Tom’s leg is growing, and so, too, is his strength. His clothes are becoming tighter and he’s acquired amazing talents that he never had before. What is happening to him? He’s just a little boy but he has the strength and brain power of a Robot. How can this be? This, the second book in the series, was written by Ann Twigg. 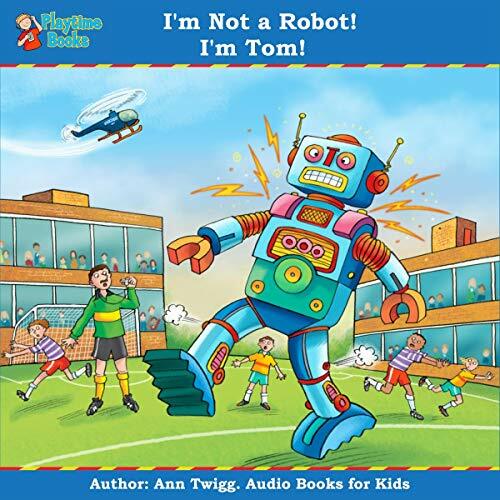 Ann wrote this story after her grandson Tom, who was obsessed by robots, asked for an exciting robot story. In this brilliantly written story for kids, Tom has to hide himself at school, before anyone notices he is changing into a robot. Many children find themselves in similar situations at school when they are shy, frightened, or just unsure about what other children will think if they are somehow different. This fantastic audiobook will have your child hooked from the outset. My children really liked this book. Ann reads it as if she has her own grandchildren Sat on her knee listening. My son really enjoyed this book, it is well narrated and a very good story. Would highly recommend.